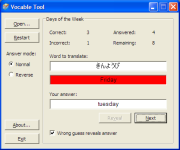 The purpose of Vocable Tool is to make it easy to learn new vocables in a different language. It is made easy by using simple vocable entries in text files which are manually written by the user or downloaded from other people. There are a few files with examples of words and expressions to begin with but it is meant to be expanded by words of your own choice by just writing them down and save as text files.